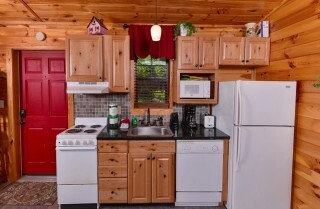 Comforts Me’s location in Beside the Still Waters also means a community of cabins that are great for groups who need more space but want to stay near. If you’re traveling with a group and need to rent multiple cabins, this is a great option. 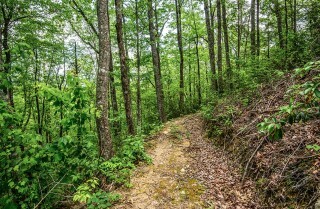 Check out sister properties Along the Right Path, Goodness and Mercy, In Green Pastures, Lacking for Nothing, My Cup Overflows, and Restores My Soul. Comforts Me provides the conveniences you appreciate at home with some of the fun perks you love on vacation. 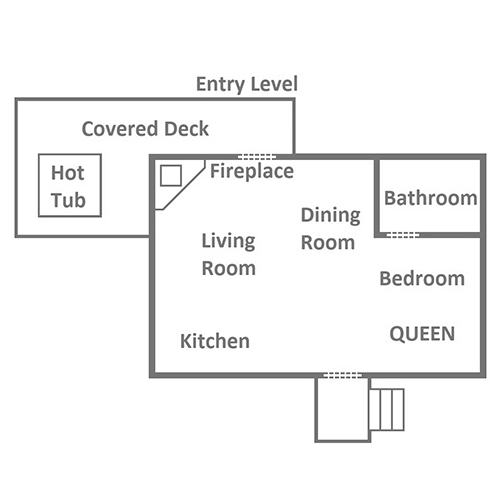 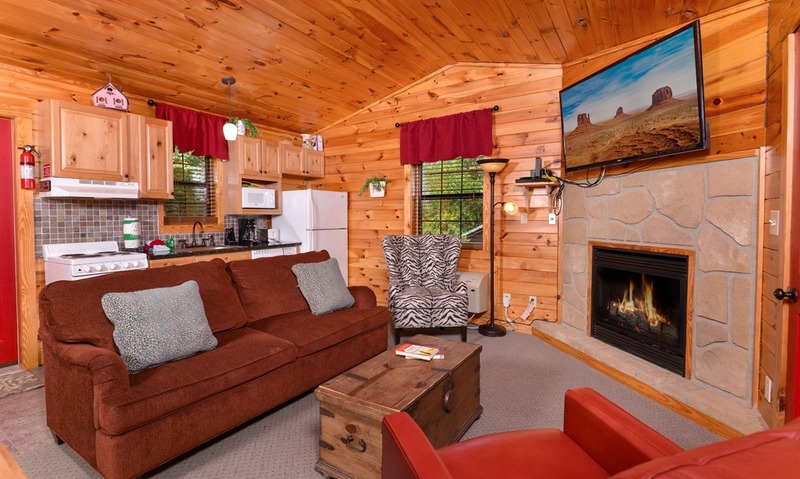 You can stay connected with what’s happening thanks to the wireless internet, bring your favorite movies to watch on the big screen TV with Blu-ray player, or create your own meals in the fully equipped kitchen here. But Comforts Me is not just about function; it’s also about pampering yourself a bit. 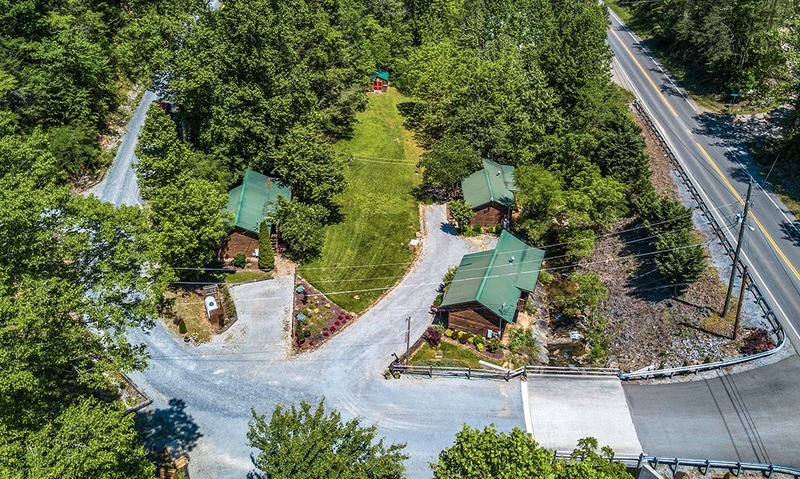 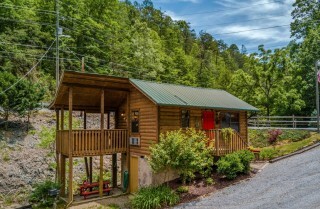 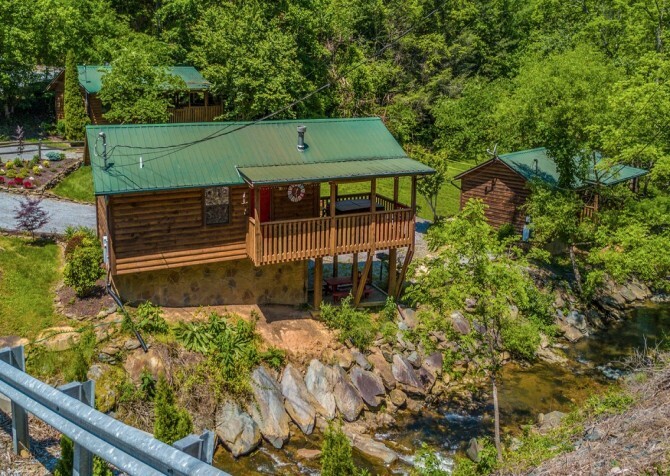 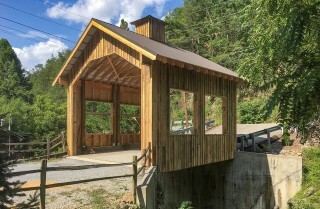 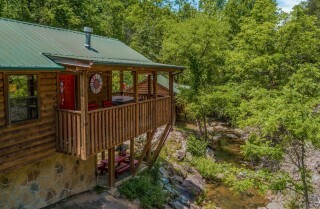 In this cozy Pigeon Forge cabin, spend days sipping coffee in your rocking chair as you listen to the water flow past, soaking in the outdoor hot tub, making s’mores over the community fire pit, enjoying outdoor meals at the table on the deck or the picnic table below, and climbing into a comfy queen-size bed for a good night’s sleep. Comforts Me also offers easy access to local fun, with a location less than 10 miles from both Pigeon Forge and Gatlinburg. 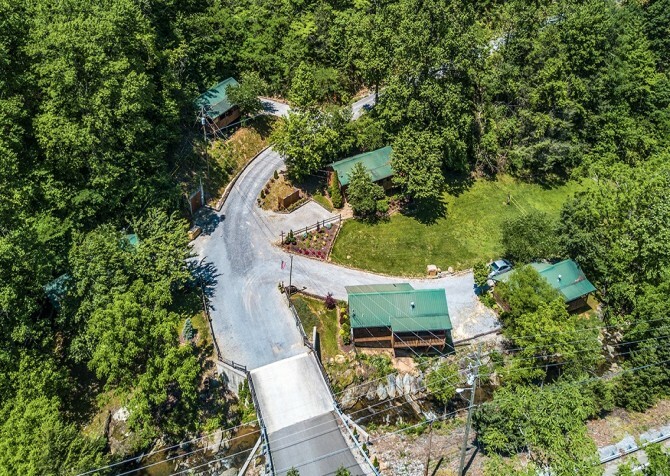 Play miniature golf and laser tag, drive go karts, touch an iceberg at the Titanic Museum Attraction, ride roller coasters at Dollywood, catch a dinner show, ski or snowboard at Ober Gatlinburg in winter, shop at the Tanger Outlets, take a scenic drive through Cades Cove, enjoy a picnic in Patriot Park, explore The Old Mill Square, or hit the trails in the Great Smoky Mountains National Park – and that’s just the tip of the iceberg! A busy day in town calls for a relaxing night back at the cabin. You’ll find yourself at home in the living room of Comforts Me, furnished with a sofa, wingback chair, and leather seat – all gathered around a fireplace and big screen TV. 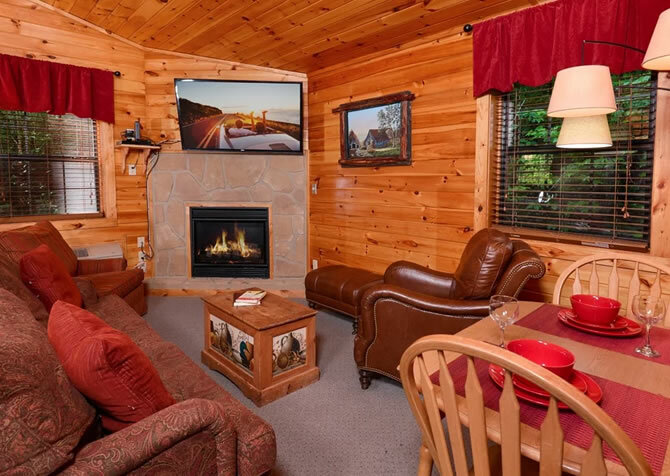 Kick up your feet, relax, and enjoy your own private space where you can cozy up as a couple, hang out with friends, or relax with family. 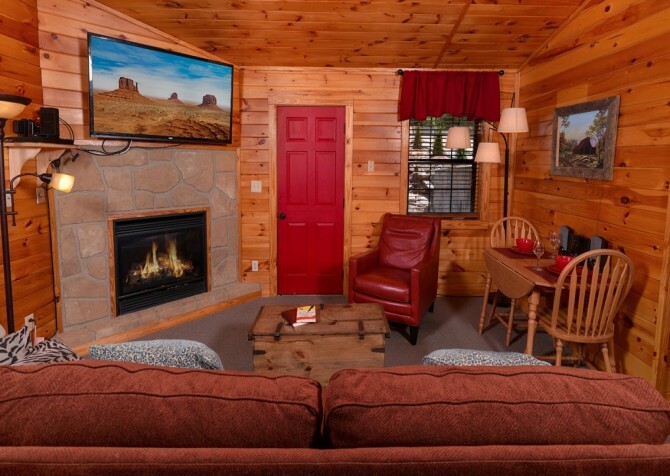 Flip on the TV to watch the big game (with snacks in the kitchen just steps away), let the kids watch their favorite cartoons before venturing into town for the day, or bring some movies to pop into the Blu-ray player. Warm wood cabinets blend with white appliances and a tile backsplash to give this cozy cabin an inviting, contemporary feel. 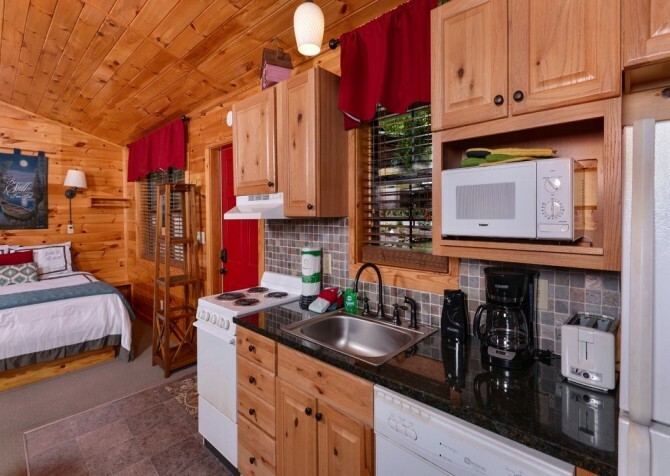 It has the amenities for creating homemade meals, the space to store leftovers from downtown, or it just serves as a place to put the pizza boxes when you order in! The cabin is equipped with a built-in microwave, dishwasher, stove/oven, and full-size refrigerator, along with a coffeemaker, toaster, knife set, utensils, and enough dishes and glassware for all 4 guests. Visit our blog to get recipe ideas for the cabin, bring your favorite holiday treats, stock the cabin with late-night snacks and drinks, or just use the space for simple pancake breakfasts and laid-back lunches. You’ll also have several options for where to eat at the cabin, including the 2-person table in the living room. 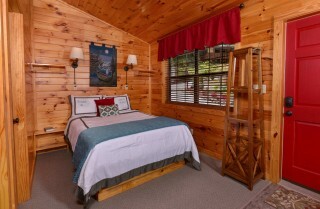 The studio-style bedroom in Comforts Me is perfectly cozy, with a queen-size bed and simple but stylish bedding. Built-in shelves and nightstands by the bed give you a place to set glasses, phones, or that book you’ve been dying to crack open. Just flip on the mounted lights above the bed and stay cozied up here for a bit. 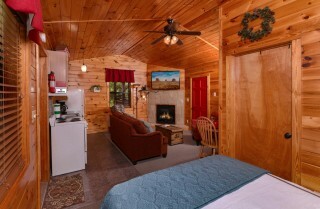 On cool mountain mornings, you’ll want to stay cuddled up here just a little bit longer! With an open floor plan in the cabin and a big screen TV in the living room, you can even watch TV from bed. Head to bed early, sleep in late, and watch your favorite shows or movies without even climbing out of bed! When you need a weekend away to just relax and unwind, this bedroom provides a great place to finish your days. 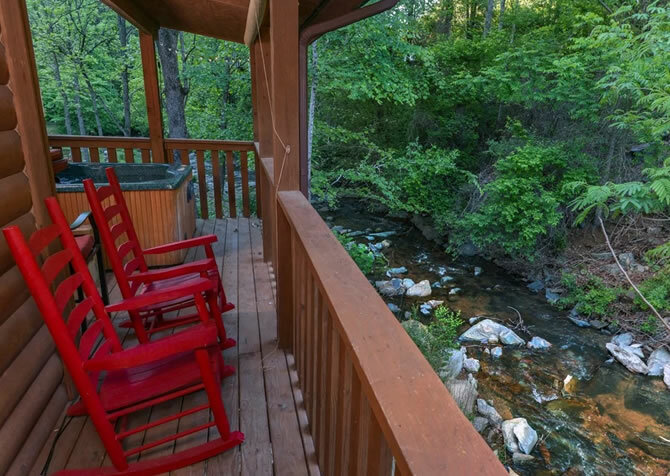 The sound of a peaceful mountain stream is the soundtrack to a relaxing weekend when you stay at Comforts Me. As you sit in the red rocking chairs on the deck, soak in the hot tub, or sit down for a peaceful meal at the 2-person table, the sound of the stream will carry your stresses away. 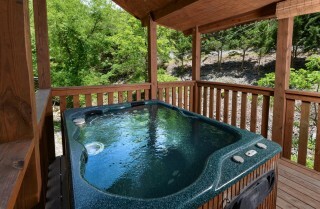 It’s a great place to just unwind and forget about it all. 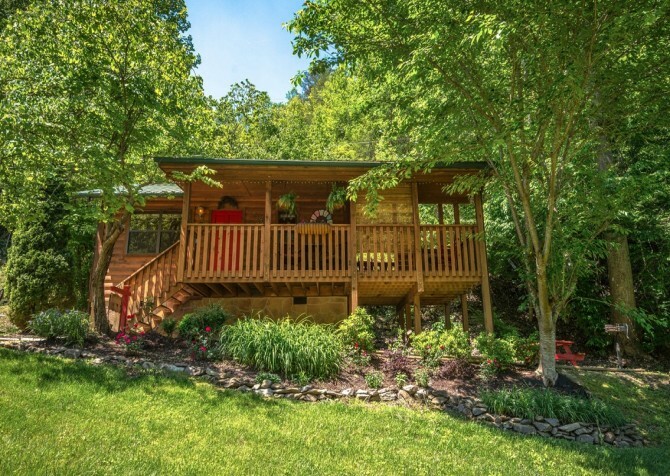 Down below, enjoy lunches at the picnic table below the deck. You’ll have plenty of shade on warmer days, and the stream flowing over the river rocks below is a lovely sound as you eat. In the Beside the Still Waters community, Comforts Me also offers access to a community fire pit where you can make s’mores and chat around the fire. 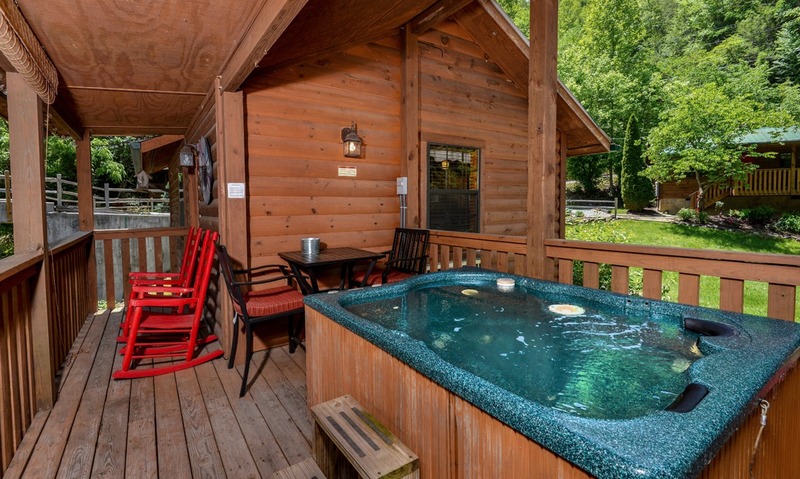 On cool Smoky Mountain nights, unwind with a drink by the fire and enjoy the serenity of the mountains. 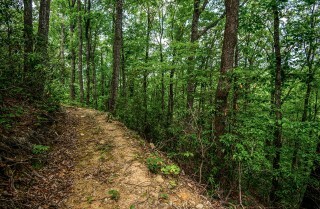 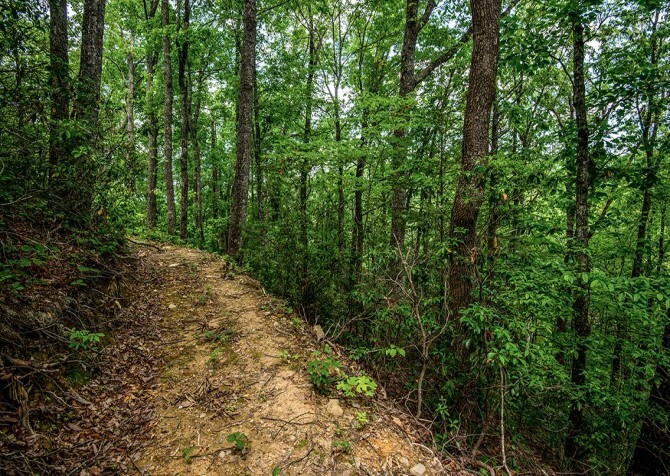 Or you can explore the nearby hiking trails when you’re ready to stretch your legs for a bit. 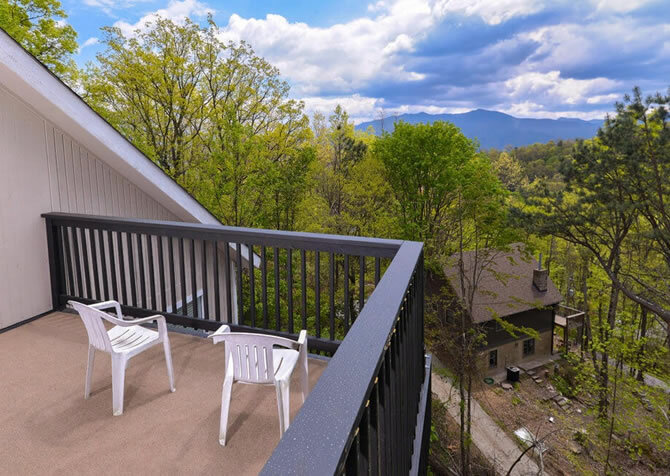 There is always something happening in downtown Pigeon Forge (and Gatlinburg), and the wireless internet in Comforts Me lets you stay updated with what events are going on during your stay. 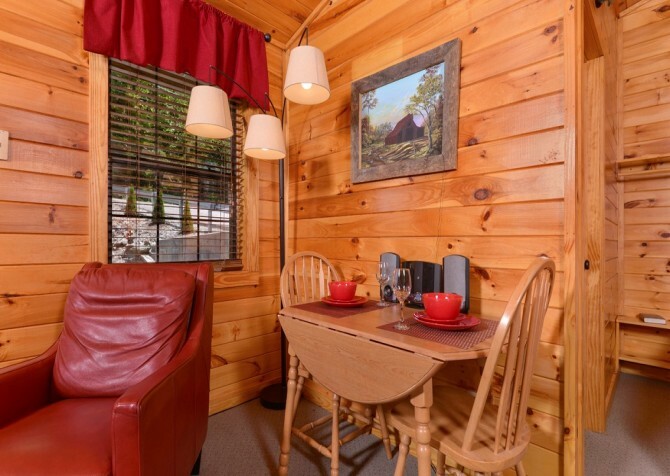 The cabin also has a queen sleeper sofa if you’re traveling with more than 2. 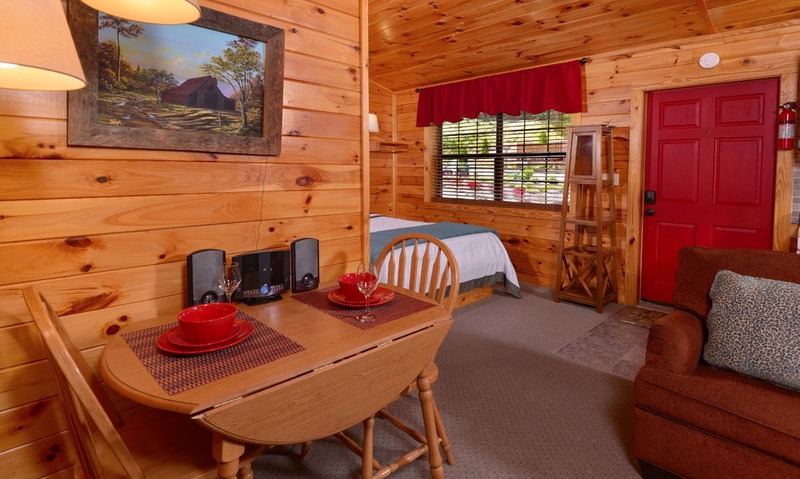 Pigeon Forge and Gatlinburg are known for their many attractions, restaurants, galleries, and shops. 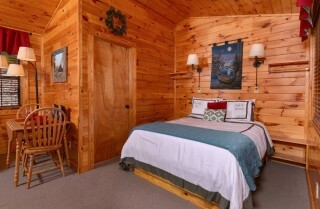 No matter what time of year you come, you’ll find plenty to do. 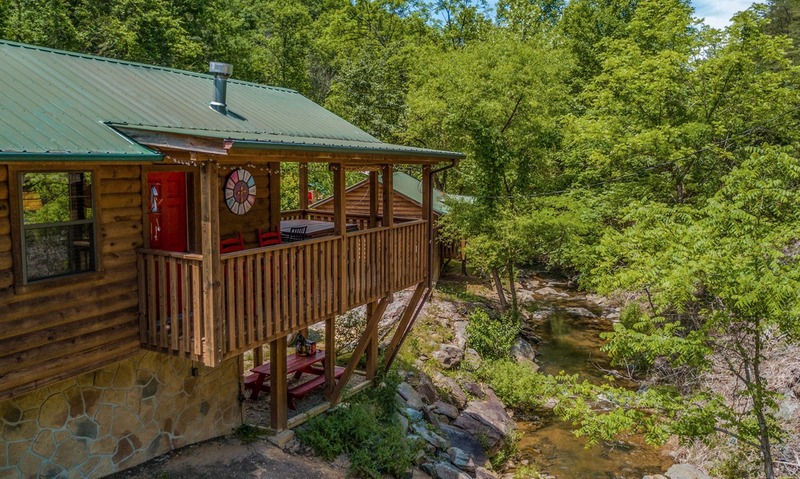 Want an action-packed vacation? 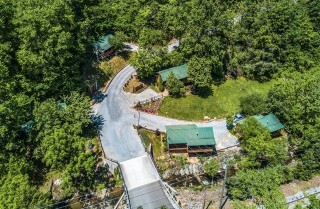 You can ride roller coasters at Dollywood, drive go karts, play laser tag and arcade games, try indoor skydiving, and more. 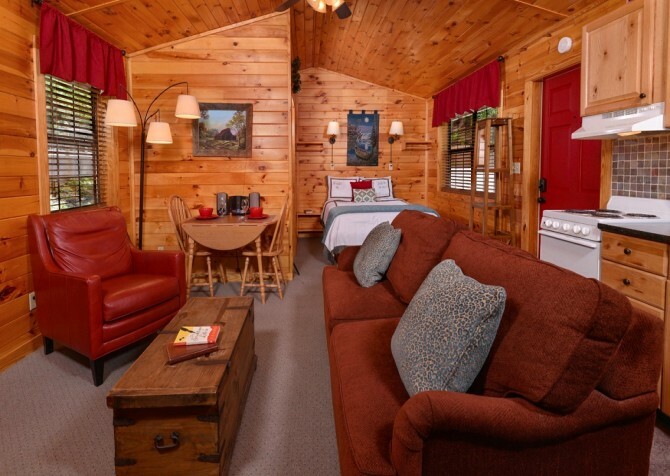 Love a laid-back getaway? 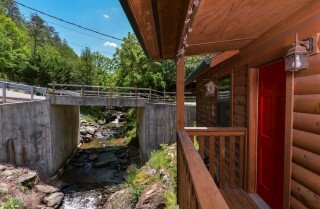 Sample moonshine at Ole Smoky Moonshine, tour the Rocky Top Wine Trail, watch a dinner show downtown, spend the day shopping at the Tanger Outlets, or meet the artists and explore the galleries in the Great Smoky Arts & Crafts Community. Roller coasters, live shows, restaurants and sweet shops, animal shows, carnival games and prizes, kids’ rides, and more – Dollywood has it all for a full day of fun! With 800+ miles of trails to explore, the Great Smoky Mountains National Park offers lots of opportunities for outdoor fun. 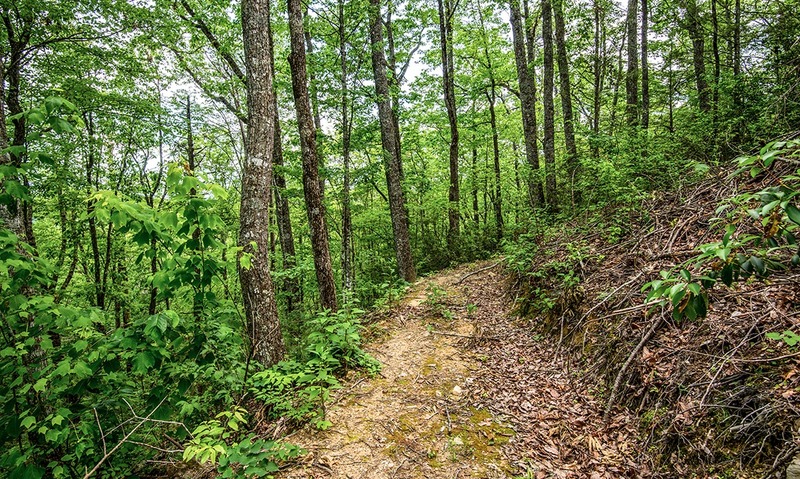 Hike, bike, go horseback riding, picnic, and more! This 11-mile loop road is perfect for a scenic drive on a peaceful day. 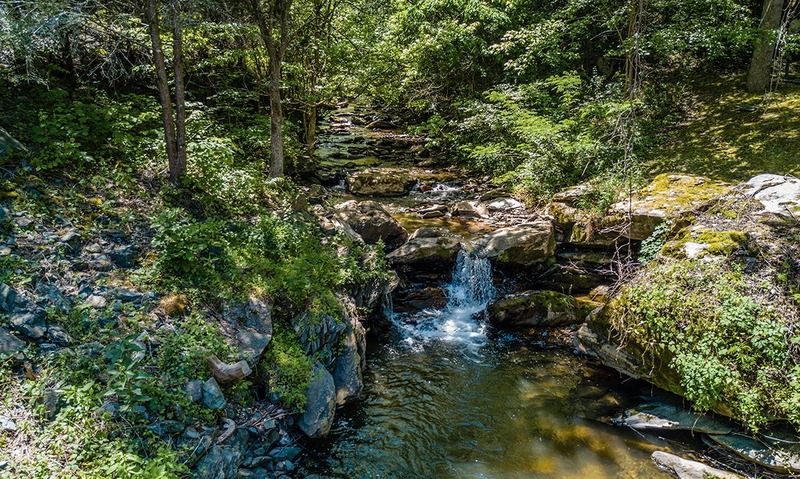 Watch for wildlife, see historic homesteads and churches, or stop for a picnic by a peaceful stream. 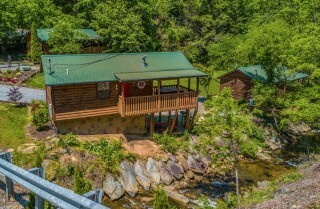 "My husband and I had an amazing time at this cabin can't wait till next time."